Got this one on the small pumkin yum dinger. Unless I'm missing something it looks like just a quick flick with the needle nose. That's weird, it can be kind of tough right there sometimes but not terrible. It didn't even require pliers or any any real effort to remove. The hook shank is under a piece of its skin, so it can't just be popped out, assuming that's the same way mine was hooked. @Bluebasser86 nice fish can’t wait to throw some of those spinner baits around here. Nice fish! I would pay that young man $5 if I could hear him say "Hey, Beavis, this fish has a big mouth, uh, huh, huh huh!" I think you're trying to be too surgical. You have to tear a little skin. It heals. Better to get the fish back in the water quick than worry about a hole. I catch bass with fully disjointed jaw hinges sometimes. It's the nature of the sport. They don't hurt like we do. Sounds like maybe you had it hooked in the joint of the jaw or maybe right behind jawbone. I've had that happen a few times and it can be pretty tough to get out. You got to get a little rough sometimes, give it a little jerk with some force to try to pop it out. You can get cheap wire cutters for $2 at Harbor Freight that will cut any hook out there if you want to have them in the future. Might be. The hooks were barbless but I just couldn't get it out for a while for some reason. I found some wire cutters yesterday so I've got them in my tackle box now. I started out like that but I started trying to tear it out pretty hard once I realized that it wasn't coming out. It was just a hard one to unhook I think. If you can't beat the Floridians, join them. Usually can't post the first fish of the year until sometime in late April around these parts. Had to plan a winter trip to Florida to make sure that didn't happen this year. 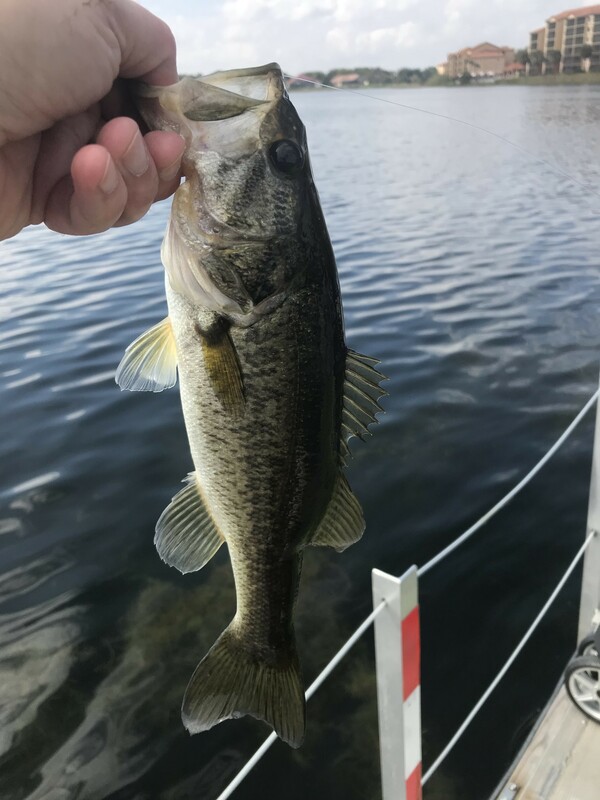 First Bass of 2019 for me. Orlando Florida vacation. 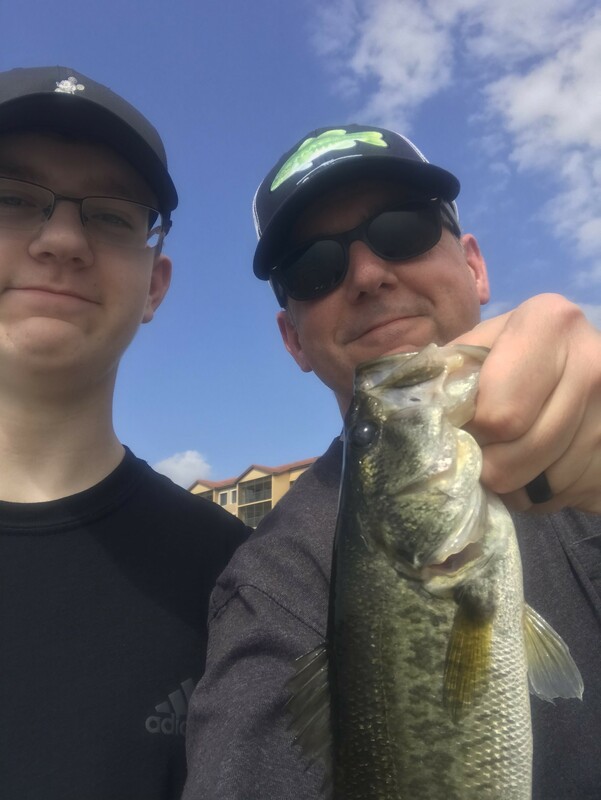 My son and I were able to steal away a few hours during the week to do some fishing. Caught this Bass on a Berkley Warpig lipless crankbait. The resort we stayed at had a resident Otter. We had fun catching Bluegill and feeding it to him. Megabsss vision 110+2 fish today on lake Okeechobie. Worth the price of what ever you paid to stay there. He kept us company while we fished. The three Bluegill I fed him helped keep him around. I asked the resort staff if it was alright to feed him and they said yes. They don't want guest feeding him people food, but freshly caught fish is Ok.
1st bass of the year. Tipping the scales at 7.02 lbs. It's my new PB! Nice fish, man. Matches my PB in weight. Yours looks a little fatter than mine was. Thanks! She was a nice one. I was thinking she'd way more than she did. I'm going to have to check my scale for accuracy at the lower range just to make sure. I checked it with a 30lb weight I had laying around when I 1st bought it. I'll have to check the recycle bin for a empty milk jug and fill it with water to see....Scale was cheap but the water test was dead on. Had some good action this afternoon with these two being the best. I know all my pics look the same but it's the only way I know to get them with my flip phone and no one else around. Usually by now I'm chomping at the bit for spring (still anxious to move on to other techniques) but this winter has been a fishing season in itself. Lots of memories. Went out to bank fish at a nearby golf course tonight with my friend Mike, whom I've been mentoring in the art of bass fishing most every Wednesday evening. I try to introduce a new bait or technique each time. Tonight was a lesson on the big ribbon tail worm, which I honestly don't throw that often. But with the rainy, dark and windless conditions, murky water, and the fish loitering in calm shallows, I thought Gambler's 13" ribbon tail in black or green would be the ticket, Texas rigged, inched slowly along the bottom. And it was! We nailed a couple of 5 pounders, and at least a dozen 2-3s in an hour or so of fishing. Nothing very large for me lately. I went out yesterday, weather was warmer, and I caught a couple very quickly, then stopped to chat with a neighbor sitting on his boathouse deck across the cove from me. I might have had 5 or so but lost too much time. Today? The weather here on Lake Athens, Texas took a turn toward colder weather so instead of dropping my canoe in the lake, I just made casts off my boathouse deck. 20 casts with a jig head and Keitech plastic, moving the lure along slowly? No bass love shown to me, not a nibble. So, before I left, I thought about making a cast and letting it sink to the bottom and I then nudged it back sort of like working a T-Rigged worm . . . and on about the 3rd twitch of my rod, one jumped on it. No, not very large, but I'll go to sleep with a smile on my face! I had about 90 minutes of free time to fish today and got blanked at one of my favorite lagoons so I headed to one that I've fished maybe a handful of times before. This one has about a 5 foot shallow shelf ringing most of the basin and lots of aquatic vegetation that extends just beyond the shelf. The HOA cut the vegetation in the fall so it was all sub surface now. There's a corner on the bank I like to fish because it allows me to easily cast parallel to the shoreline. I tossed a Teckel Sprinker frog along the edge of the weedline and got my only bite of the day but it was a good one. Big blow up and an easy hook set. There happened to be 3 or 4 golf carts passing by at that moment and they all stopped when they heard me say, "Whoa!" I said that because as I was fighting it I could see it was a big largemouth. I'm thinking I'm about to land my personal best. But as luck would have it pre-spawn activity has just started here and she was skinny and not carrying eggs yet. I didn't get the length, but it was l-o-n-g (I'm actually short arming it in the photo below) but it did weigh in at 5.8 pounds so I'll take that. In three weeks I bet she's a tank. I'll definitely hit that lagoon again. We finally had a day above freezing here Friday (and it's going to be the only one in about a 10 day stretch). It didn't make it much over freezing though because my guides were icing most of the day. It was a grinder, catching a fish here and there, about a fish a hour until I finally got on one spot they were concentrated a little bit. Unfortunately my catching attracted some unwanted attention and that spot was quickly ruined by an idiot with a throw net. Thankfully, I managed to land my biggest of the year so far before that happened. I honestly thought it might have been much bigger but it was so short, needed her to have more distance between the head and tail. Only about 20" long and 6.56lbs though, super thick and healthy. My homemade spinnerbaits were still catching some good quality fish too.